I am working with my new Canon EOS 20D digital SLR, which I bought after a buddy snatched up my Nikon D70 for his dad. I highly recommend the camera to anyone who can afford it and either takes pictures professionally or, like me, is moving into serious amateur photography. Warning: This camera could easily be more than what most people need. For me, the 20D is a rude indictment about how ill-prepared I am to move to digital SLRs. My problem isn’t so much photo basics but understanding lenses, their idiosyncrasies, and what might be right for this camera and my shooting needs. I bought the 20D basic kit, rather than wait for the more-expensive one with the 28-85mm lens. The kit comes with the OK, but not great, 18-55mm lens introduced with the Digital Rebel. Two reasons for the low-end kit: I wanted the camera right away, and I was willing to purchase another lens with a little more reach. I tend to shoot more from a distance and zoom in. Canon’s EF28-135mm F3.5-5.6 IS USM seemed like a nice compromise for all-around lens; I picked up the lens from Penn Camera on Friday. Right now, I am working with both lenses using the 20D’s automatic settings. I’ll worry about other adjustments later on. Results are surprising. 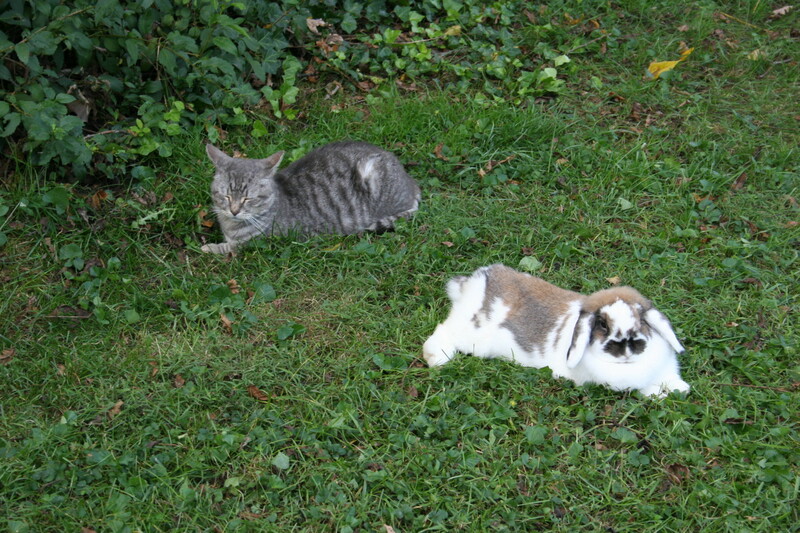 I took the kitty and bunny image above using the 18-55mm lens. Shutter speed 1/125 sec., ISO 400, 55mm focal length. It’s immediately obvious the problem when looking at the bunny’s white fur. The entire series of images show the same tendencies. I have much to learn about this camera and how to get the most out of it and these two lenses. But, based on my experience with the Digital Rebel and D70, I expected more using the automatic settings. Of course, what I know about using this kind of camera could fill about five pages of a 1,000-page blank book. This afternoon, I am headed downtown with my daughter to the Smithsonian Air & Space Museum. The trip will be an excellent real-world test of the 20D and my fledging photography skills.